Update: Kyle Wood, who originally told the Daily Caller he was brutally beaten at his home in a politically motivated attack, because he is a gay republican, has recanted his story. A city of Madison police report now shows the statements wood made about the alleged attack were unfounded. It is a crime to file a false police report and according to local police, Wood may face charges for his false claims. Violent left-wing thuggery in Wisconsin is becoming a trend in the weeks leading up to November’s presidential election. After the son of State Senator Neal Kedzie, Sean, was brutally beaten late last week, another individual with ties to a GOP politician has suffered a severe beating with explicitly political motivations. Kyle Wood, an openly gay Republican working to elect Republican Chad Lee to Congress, was attacked in an apparent hate crime while getting ready for work in his home. Wood explained he believed the attack and slurs are sparked from his openly gay status and supporting a straight Republican against a gay Democrat, Mark Pocan. Lee and Pocan are battling over Rep. Tammy Baldwin’s seat, currently being vacated in her run for Senate against former Governor Tommy Thomson. 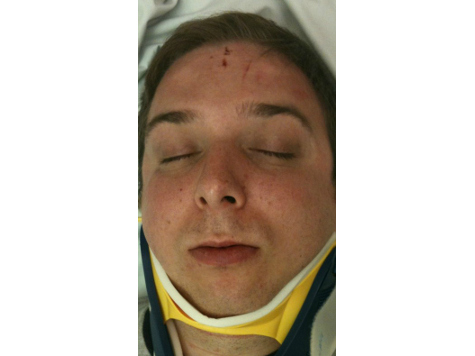 Wood suffered lacerations to his neck, a concussion, and eyes swollen shut from the beating, and was unable to move the right side of his body immediately following the attack. Both the Pocan and Baldwin campaigns have yet to comment on the attack, along with the Human Rights Campaign, a far-left gay rights organization. Wood vowed he “will not be bullied, intimidated or threatened into abandoning” his moral values.